So the new 13-inch Touch Bar MacBook Pro is a beast with the new i5 quad-core processor, but it's still packing integrated graphics that isn't much faster than last year's base 13-inch MacBook Pro's graphics. 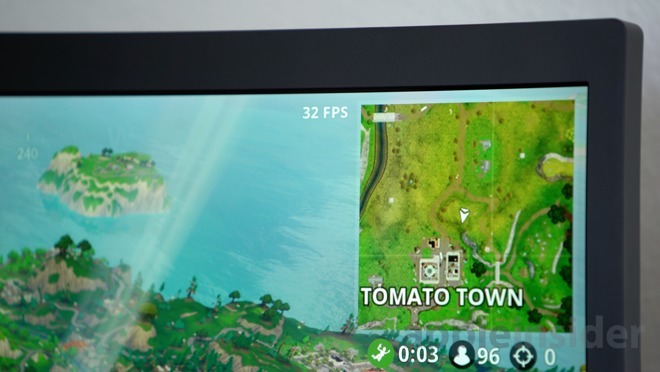 Luckily, the new Blackmagic eGPU can take care of that, and what better way is there to use it than to play some Fortnite? Before heading into the game, there's a few points that need to be brought up. First, the Blackmagic eGPU won't work in Windows 10 using Bootcamp plug-and-play. There are ways to get it going, but they are complicated, and we don't recommend them for all but the most technically proficient. Apple's eGPU implementation really demands that it be used with an external monitor, like LG's UltraFine 5K display, but there are individual Terminal commands to enable the EGPU to perform calculations without a display. If you need to use multiple applications at the same time, there's actually a script called set-eGPU that'll allow you to use the Blackmagic eGPU without an external monitor across many applications that wouldn't ordinarily support it fully under High Sierra. 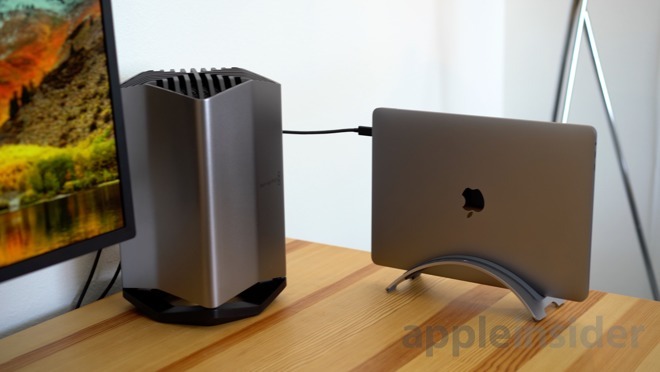 We will look into how to set that up and testing the performance of a looped-back eGPU to the internal MacBook Pro display in a future article. 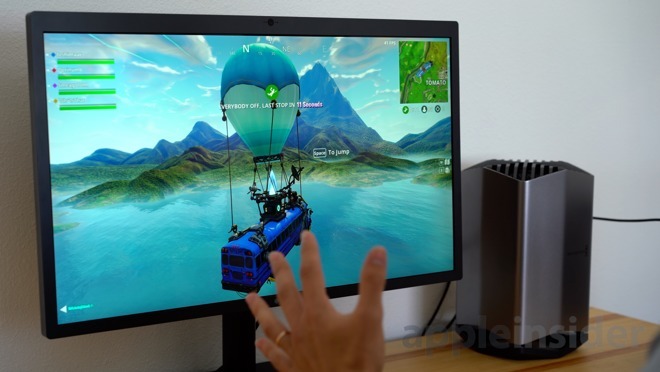 We have also confirmed that you can use a USB-C to DisplayPort cable or HDMI cable to hook up pretty much any external monitor you have, with a limitation of 4K at 60 frames per second. 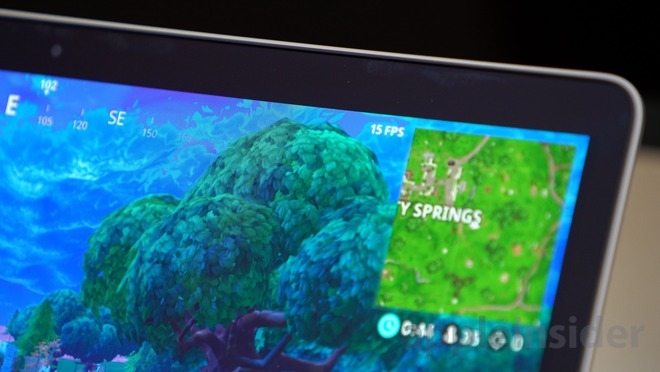 Getting into the game itself, we're attempting to run the game at the MacBook Pro's native resolution of 2560x1600, and the frames per second are extremely low. At high settings on everything but the shadows, huge lag spikes are observable, and the game is sticking at around 15 frames per second. This is totally unplayable for the vast majority of users. Sometimes it spikes down to a super low 7 frames per second, plus, the fans are kicking up like crazy! We then changed the resolution to 1903x1189 because of the 16:10 aspect ratio, but it's close enough to 1080P, and reduced the graphical quality to medium. Obviously this makes the game look pretty bad, but in this state the frame rate slips makes even the initial landing problematic. 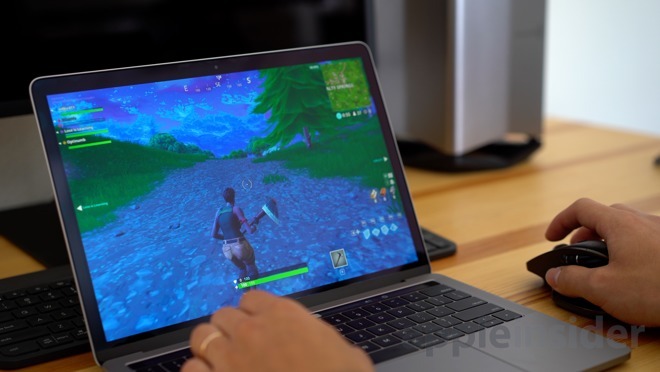 So the conclusion from that test is that Fortnite is pretty much unplayable on the 2018 13-inch Touch Bar MacBook Pro, unless you turn the graphics settings all the way down to low. At an even lower than HD resolution around 720P, maybe you'll get a great playable experience. At this resolution, the game sat at around 35-40 frames per second, and that's honestly not enough because there are still frame spikes. 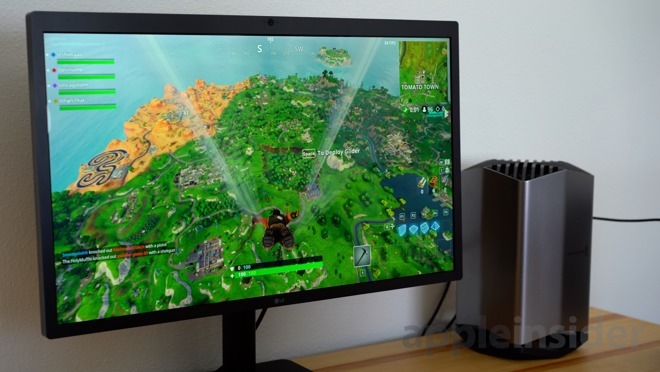 Next, we plugged in the Blackmagic eGPU and the LG UltraFine 5K display, to see if we can play Fortnite at 5K resolution. In this case, the resolution was set to 5120x2880 with the graphics settings on high, including the shadows. Right from entering the lobby, you can immediately see how good the graphics are, with everything appearing sharp. At 5K with default settings, the frames per second is around 30 to 32, which is actually not too bad considering it is being played at a 5K resolution. This is quite a feat, considering 5K at 14,745,600 pixels has nearly twice the number of pixels as 4K with 8,294,400. 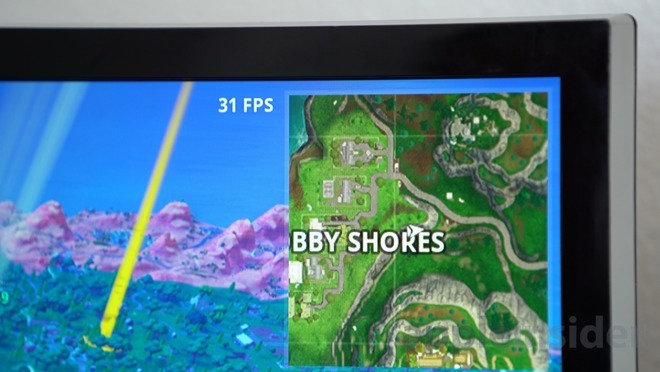 Even though the frames per second is around what we saw with the MacBook Pro by itself, it's actually a lot more consistent and gameplay is a lot more smooth. You don't see any of the frame drops from before with the MacBook Pro alone, which made the game totally unplayable. Switching down to medium graphical settings in 5K, it is noted that there is practically no fan noise when loading into the game. The Blackmagic eGPU is totally silent! Even at this graphical setting, the 5K resolution still means everything appears quite detailed. At this point, the game is sitting at around 40 frames per second, but gameplay is still smooth. Moving down to 4K, 3840x2160 and changing the graphical settings the Epic" maximum they can go, the game oddly starts to look a little blurry. This is because the game is running at slightly below the optimum resolution for the monitor. With these settings, the game averaged at around 35 frames per second, which is not too great, but it is very smooth. Playing at 5K with medium quality graphics looked much better than this. Even with this change, the Blackmagic eGPU is continuing to do a great job. It's completely silent, like you wouldn't even be able to tell that's it on. Continuing the test, we moved to a 4K monitor and hooked it up using a USB-C to DisplayPort cable. In this case, we used a Samsung LU28E590DS/CR 4K monitor, which has far better overall performance and color saturation that the LG 5K. Under these conditions, we're still looking at around 30 frames per second average in 4K Epic quality, but this honestly looks so much worse than before. We dropped the graphics quality down to high, which resulted with an average of 40 and occasional spikes at 50 frames per second. This is still playable, but we're still not reaching anywhere near 60 frames per second. In the future, we're also going to test out the 2017 13-inch base MacBook Pro and see if the dual-core CPU bottlenecks the Blackmagic eGPU. We'll also test out the 2018 15-inch MacBook Pro as well, to see if our findings also apply to that model. 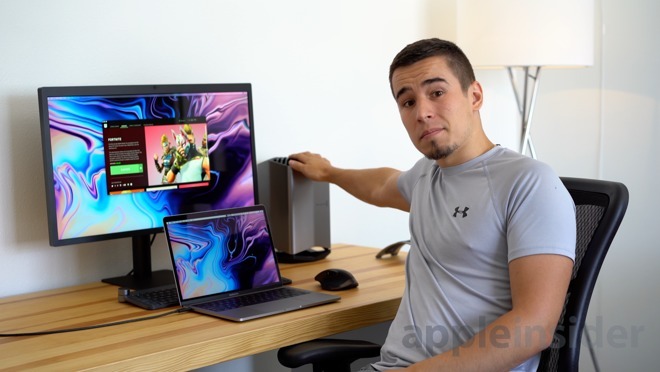 The best thing about this eGPU is that you can hook it up to LG's UltraFine 4K or 5K monitors using Thunderbolt 3, which you could not do before with any other eGPU. Otherwise, if you have any other display, the Blackmagic eGPU will still work with HDMI or a USB-C to DisplayPort cable. 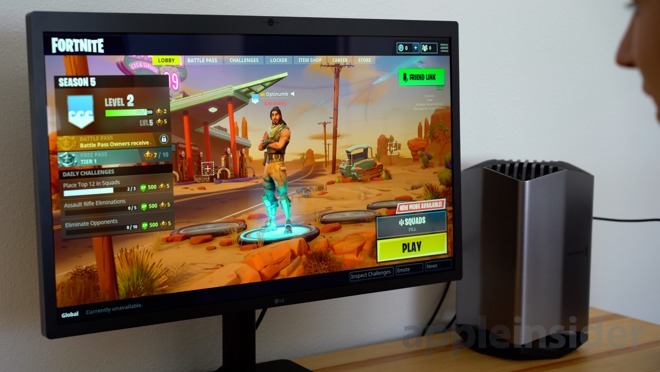 We will also be testing out the set-eGPU script that's going to allow you to hook up your MacBook Pro to the Blackmagic eGPU without an external display soon, which could be handy for those who want to get their "Victory Royale" in a more compact gaming setup.